Sherman County may order owners of a 2,000-acre organic farm to spray noxious weeds or face a possible quarantine. Meanwhile, the Oregon Wheat Commission and several growers are meeting with the state agriculture Director Alexis Taylor, hoping to enlist the department’s support. Oregon Tilth, which certifies organic operations, is calling for calm and urging the county to pause its enforcement timeline. Executive Director Chris Schreiner said Oregon Tilth hopes mediation can result in a weed management plan that allows Azure Farms to retain its certification while addressing concerns of neighboring farmers. Another area farmer, Ryan Thompson, said the county needs to stand its ground on the weed issue. The problem has been building for some time. 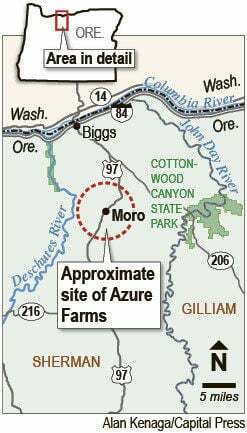 Azure Farms appears to consist of three entities: A parent company, Ecclesia of Sinai at Dufur, in neighboring Wasco County; Azure Standard, in Dufur, which distributes organic products; and Azure Farms, the farmland near Moro, in Sherman County. In a March 2 letter to Ecclesia of Sinai at Dufur, weed district Supervisor Rod Asher said the noxious weeds “have been found to be growing rampant and unchecked on your properties in Sherman County” and had to be destroyed. Asher said Sherman County takes weed problems seriously. “The potential damage and economic loss caused by noxious weeds to an agricultural based community can be substantial,” he wrote. The farm has since adopted a more conciliatory position. In a video posted May 12, Azure Standard CEO David Stelzer, the brother of Nathan, acknowledged the farm has “room for improvement.” He said one of the problems is that for the past five years, the family has been farming the Moro property “long distance” from Dufur, which is 48 miles away by vehicle.